Description Of Item: Recreate the Battle of Hoth! It?s the 10th anniversary of LEGO� Star Wars, and Imperial forces are invading the Rebels? secret base on the ice planet Hoth! As Han Solo leaves for a mission on his tauntaun, snowtroopers attack with their heavy repeating blaster. It?s up to the Rebel Alliance troopers to fight back with their missile-firing defense turret and trench with figure-flinging battle action. 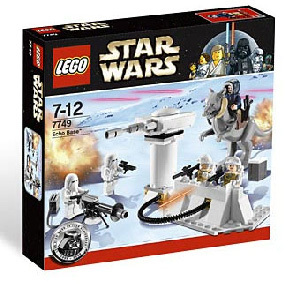 Includes 2 Snowtroopers, 2 Hoth Rebel Soldiers, Han Solo with Hoth gear, and the first-ever LEGO Tauntaun!